Our CEO Matthias Aebi was recently invited to give a speech at the “Präsentaining” conference, held by the event management company Habegger AG, focusing on cutting-edge innovations in the field of presentation methods and technologies. Matthias, you had the chance to give a speech at the “Präsentaining” event. What are the current trends in the field of presentation? There are a variety of new technologies available in this field today. As a result, “Presentation” as we know it and have practiced for many years is drastically changing. It is not just about replacing a technology or a tool with a newer one; it is about creating a new process of storytelling with new forms of content creation and delivery. Apart from technology, what characterizes the next generation of presentation methods and techniques? Non-linear presentations, I’d say. By dividing your presentation in different thematic areas and content & data collections you consciously start to play with the typical order of the storyline. However, you can then smoothly jump from one topic to another, based on real-time feedback, request, time or ideas, without losing the central idea and thread. The result is a more dynamic and interactive dialogue, instead of a monologue, which automatically leads to a greater emotional involvement and engagement of your audience. 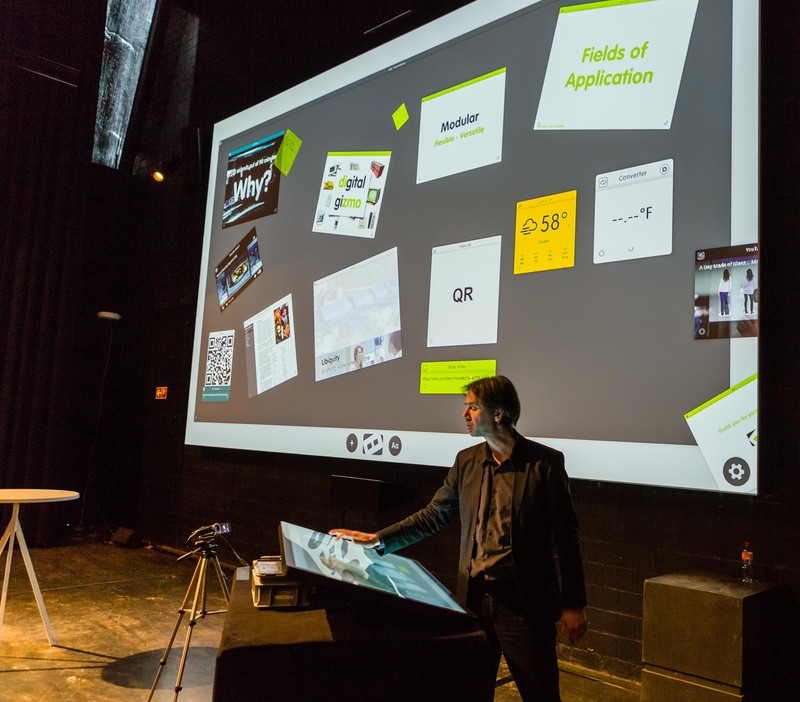 Why do you think, interactivity is so important for a successful presentation? Interactivity is what makes us “walk the talk” of the digital age. We cannot talk about the transformation the digital age entails, and the impact it has on how we live work and play, using yesterday’s technologies. “Interactivity” in this context is twofold: interaction with the audience and with the content, which also means interaction of the audience with the content. The central goal is not only to entertain your audience, but also make them an integral part of the whole experience. By allowing active participation, the audience’s level of interest and engagement increases, together with the ability to tune the message and clarify ambiguities. At the same time, data interactivity, allows to deep dive into content and make it more relevant and attractive. A problem that presenters can face is that they often present out-dated facts and figures – how can one avoid that? We live in a real-time society. It is therefore very important that you interactively integrate live data into your presentation. With online-tools such as dizmo you can connect data in real-time and show live situations instead of underpinning it with outdated data and yesterday’s facts. We all have been attending long presentations with endless slides and decks that are overloaded with material – any formula on how to not fall into the same trap? Less is definitively more here! It’s all about leaving a lasting impression on all attendants. It is important to concentrate on a few points and never lose sight of the read thread. That is why it is important to use technologies that allow us to adapt content to time and feedback, and not the other way around. And as a final take-away for the reader: what should never be forgotten when it comes to giving a presentation? Surprise! Surprise your audience! Break established order and structures. Dare to leave the trodden path – it increases the engagement and attention of your audience by far.